The moon is one of my favorite topics to delve into, especially when the weather starts getting colder and we approach the winter months as it has a power to tantalize the psyche. In times of struggle or peace we look to the sky for consistency and stability, using the moon as a guidepost for the passage of time. Along with the seasons, the moon and its phases have been one of the best medium-length measures for time since humans realized it repeatedly cycled in the sky. That is why each full moon, along with other cyclical events, received names that corresponded to what was going on in the world around them. There are usually 12 full moons per year, but every 2.7 years there is an extra full moon named the blue moon due to the difference in the lunar synodic months and the tropical year. Every 19 years, February will miss a full moon due to the blue moon appearing in both January and again in March. But outside of these rarer occurrences, each month typically has a full moon, each of which has a specific name. The names come from many sources, but in the English language most come either from Anglo-Saxon origins or are adopted from Native American peoples. The most well-known moon might be the harvest moon, which is the full moon closest to the autumnal equinox. It isn’t specific to a month as it can fall in either September or October. The common name for the September moon is the corn moon, referring to the time when corn is ready to harvest, while the October moon is the hunter’s moon as this was when people would hunt after the harvest to stock up on meats for the long winter. Other notable full moons are the worm moon in March, when earthworms leave trails in the newly thawed ground, the strawberry moon in June when – you guessed it – the strawberries are ready to pick, and the snow moon (or hunger moon) in February when the winter has stretched on and all seems to be snow or hunger. But the most important moon to discuss today is the wolf moon, as January’s full moon is known, which acknowledges the howling of the wolves due to the scarcity of food in the harsh winter. Why is the wolf moon so important? Because that inspired my nickname for the new MB&F MoonMachine 2, which was launched at SIHH 2018 in January. The Wolf MoonMachine . . . er, the MoonMachine 2 is built on the HM8 platform and contains only the third moon phase complication in an MB&F timepiece since the founding of the brand. Since two of those moon phase complications came about thanks to Stepan Sarpaneva, you could say that Sarpaneva is the master of moons for MB&F. And the MoonMachine 2 is an awesomely unique watch. The road to the MoonMachine 2 began back in 1999 when MB&F founder Maximilian Büsser and Stepan Sarpaneva first met, beginning a friendship that would lead to collaboration once Büsser launched his own brand after leaving Harry Winston. By the time MB&F launched in 2005, Sarpaneva had been working for more than a decade for some of the most prestigious brands in independent watchmaking. He launched his own company two years prior. His watches were inspired by his passion for motorcycles and a life spent in the world of design thanks to his parents. The moon became a mainstay in Sarpaneva’s watches, and by 2008 with the birth of the Korona K3 it had taken its now-familiar form: the slightly sour and melancholy manifestation of Sarpaneva’s own Finnish demeanor. To Sarpaneva, it didn’t feel right to have a smiling moon since the Finnish people are a generally serious bunch, so the iconic face emerged to grace all manner of watches without so much as a smirk. It became so popular and well known that it must have made sense to Büsser that the wild, edgy MB&F watches feature the unique lunar visage as the HM3 MoonMachine in 2012 was the first collaboration for the pair. The response was outstanding. It gave Sarpaneva a boost in popularity and helped MB&F cement its position as the darling of the independent circle (at least in my eyes). The new MoonMachine 2 marks the triumphant return of the melancholy moon from Finland and in a manner so awesome it may just trump the first. The MoonMachine 2 features the Sarpaneva moon phase in the case of the HM8 to create the first projected moon phase in a watch. The HM8 uses a prism to project the time forward from a set of disks underneath, also magnifying them for better legibility. The case of the HM8 is a very bold homage to the Can-Am race cars active from the mid-1960s to the late 1980s featuring roll bars and a cockpit-like feel. The time is read on the front of the piece like a driving watch (big surprise) thanks to the prism that fills the leading edge. The jump hour disk (oh, yeah, jump hours) is projected on the left side of the prism, while the running minutes are on the right side. On the original HM8 this left a big gap between the two disks that didn’t highlight much of anything, so this was the natural place to add in the Sarpaneva moon phase. Visually it was fine: there was unused space to add in a complication, but mechanically it was a definite challenge to keep the case to the same dimensions and squeeze in a moon phase complication between the movement and the prism. The envelope to work with was rather small, so the mechanism had to be slipped between the time disks and the prism, keeping it as thin as possible to avoid re-engineering the entire case – or worse, the movement. In the end, it was able to fit nicely along with an adjuster integrated into the side of the case without any major adjustments to the rest of the assembly and only a 0.5 mm increase in case thickness. And now that the center of the display is filled in, the entire front of the watch feels changed. It is almost as if the original HM8 was a prototype of the MoonMachine 2 as it seems complete with the addition of the moon phase. Sometimes less is more, and negative space can be used to great effect. But in the case of the MoonMachine 2, that negative space wasn’t nearly as powerful as the tiny, melancholy moon slowly gliding past the projected window. The moon details don’t stop there, however: they continue through the watch and into the rotor and large sapphire crystal over the movement. The battle ax has been replaced with the pierced disk, which also contains another example of that reserved Finnish moon. 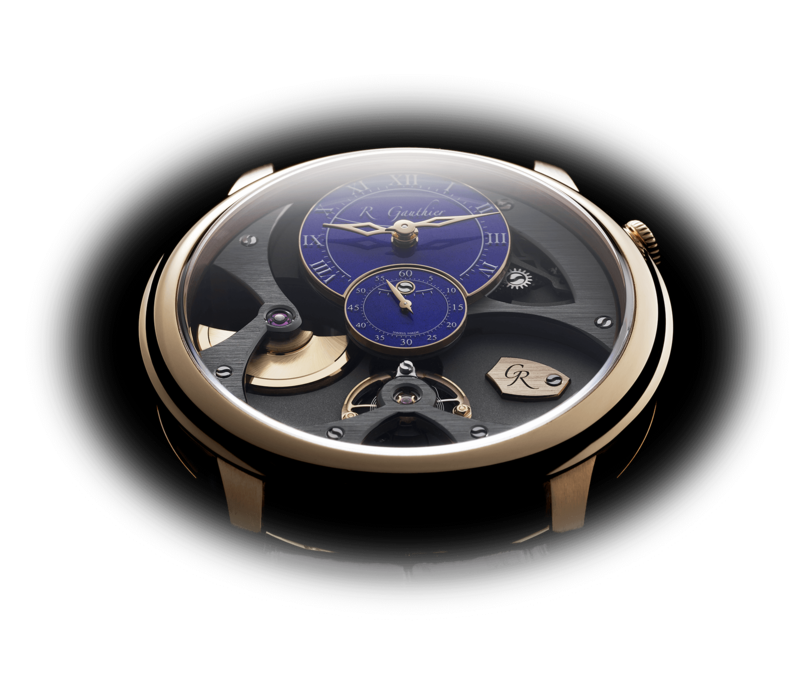 The sapphire crystal even echoes the rotor decoration with metalized lines matching the heavy cutaway pattern. That pattern is actually part and parcel of the moon phase complication from Sarpaneva thanks to the thought behind its inspiration. During a chance stroll in the moonlight, Sarpaneva noticed the bright moonlight shining on an iron grate that surrounded the trees along his street. The grate and its shape were something he had never paid much attention to, and the moonlight helped him truly see it for the first time. It stuck with him and he began sketching the pattern, developing it into the dial found in the original Korona. Later Sarpaneva combined this with seeing the moon through an iron fence and tree branches, and the idea for the Korona K3 was born. Now this pattern is found in many of his pieces, and it is intimately tied to the melancholy moon here found in the MoonMachine 2. The idea of seeing the moon through bare tree branches and combined with the stern face of his moon reminds me of the threatened wolf species in Finland that was once hunted to near extinction before becoming protected. Imagining the wolf howling at the moon through the branches of a Finnish forest in the dead of winter seems to fit so well with Sarpaneva’s moon. Of course I might be projecting a bit, but I feel a connection there – perhaps at a distance, but there nonetheless. It’s possible the MoonMachine 2 is just an awesome watch that features a cool implementation of Sarpaneva’s sweet moon phase, but it’s also possible that underneath the surface, there is a deeper connection to the wilds of Finland. Sarpaneva is rather wild himself, so maybe, just maybe, he is the aforementioned wolf. MB&F has a way of drawing the best out of people, and this new Moonmachine clearly is an awesome result from the work with Sarpaneva. If we need to wait another six years for a possible MoonMachine 3 I will be rather disappointed. But if the next one is as good as or better than MoonMachine 2, there are good things in our future from MB&F and Stepan Sarpaneva. I’ll let you ponder what that might be while I break it down! Wowza Factor * 9.8 I don’t know if anyone has ever not immediately been wowed by an MB&F piece in one way or another. Late Night Lust Appeal * 98 » 961.051m/s2 A moon phase MB&F has enough staying power to keep me up for multiple nights just lusting after it! M.G.R. * 64 Solid base mechanism with modules and modifications means one happy nerd writer! Added-Functionitis * Mild Gotta be fair when you say there is only one added complication, even if it all results in such a super awesome avant-garde timepiece. Still, there is only a need for children’s-strength Gotta-HAVE-That cream! Ouch Outline * 10.75 Hyperextending your knee when you miss kicking a soccer ball! Charlie Brown knows what I’m talking about: one missed step and you’re out of whack for hours. Well, maybe only when you aren’t a teenager anymore. Regardless, I’d do it again if it meant getting this bad boy on my wrist! Mermaid Moment * Full moon again! By the time the Sarpaneva moon fills the window you will be filling a schedule for the ceremony! Awesome Total * 869 Take the cube of the number of pieces in each case metal version (123) and divide by the water resistance in atmospheres (3), then add the number of components in the movement (293) for a lunatastic awesome total! What a joke. All that money for an ugly contraption that tells the approximate time.